We would like to introduce one of our newest artisans. Heng Sreymom has recently joined Elevita and creates the most wonderful bags. She is 33-years-old and was born in Phnom Penh, Cambodia. She has no formal education, though she can read a little. She is a single mom with two delightful boys, ages 9 and 10. Her husband left her five years ago leaving her with no clear way to support herself and her children. 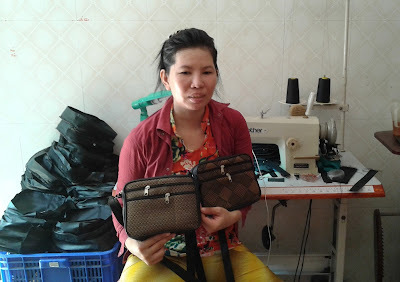 Recently she learned how to sew and has specialized in sewing beautiful, high quality handbags. With Elevita's help, she hopes to broaden her market and sell her handbags to a wider clientele so she can properly care for her children and herself. We are delighted to have Heng Sreymom join the Elevita team of artisans. 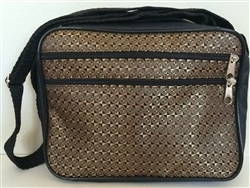 Heng's practical handbags are beautifully made of durable synthetic material and are 9 inches long and 6 inches wide. 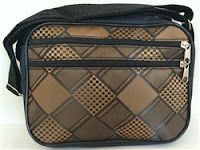 Each bag zips across the top and has two outside zipper pockets and one small zip pocket inside. The adjustable strap measures 45 inches when extended. Visit www.Elevita.com to purchase these and other wonderful products from our artisans around the world!